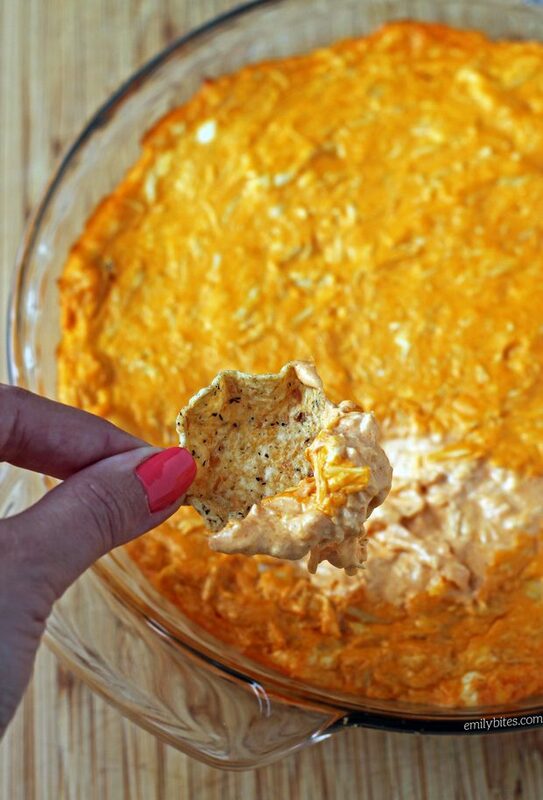 This easy, flavorful lightened up Buffalo Chicken Dip is just 5 ingredients and sure to become one of your party staples. I honestly can’t believe it has taken me almost 8 years to put this recipe on my site – I’m from Buffalo after all! I promise you all that it was worth the wait. This spicy, creamy, cheesy hearty dip is a major crowd-pleaser and perfect for football watching, girls’ night in or any other get together with friends or family. You can also easily double the recipe to serve more people or heartier appetites, just serve it in a 7×11 or other 2 quart baking dish. 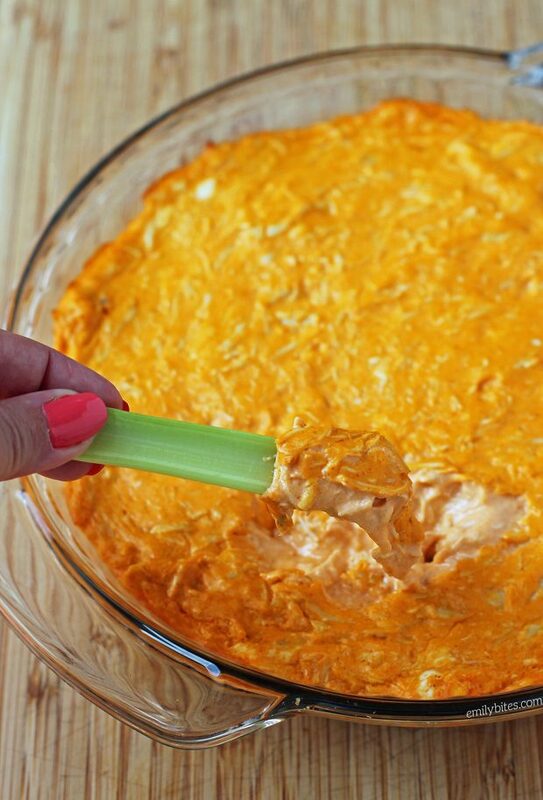 Not only will all your guests ask you for this recipe, but they’ll be shocked to discover that this Buffalo Chicken Dip is just 105 calories or 3 Weight Watchers SmartPoints per serving. Just serve with veggies, tortilla chips, crostini or pita for dipping and watch it disappear. Served with celery or other veggies makes this a decadent low carb treat! Don’t forget to check out my Easy Slow Cooker Shredded Chicken post- the perfect way to make shredded chicken for this recipe! If you’re on the hunt for more delicious dip recipes, check out my Pepperoni Pizza Dip, Chili Cheese Dip, Cannoli Dip, BLT Dip, Greek Layer Dip, Spinach & Artichoke Dip, Hot & Cheesy Bean Dip, Beefy Enchilada Dip, Caprese Dip, Creamy Dill Dip and more in my Appetizers category! In a mixing bowl, combine all ingredients and stir together until smooth and well mixed. Spread the mixture evenly across the bottom of a 9” pie plate. Place in the oven for 20 minutes until heated through and serve. 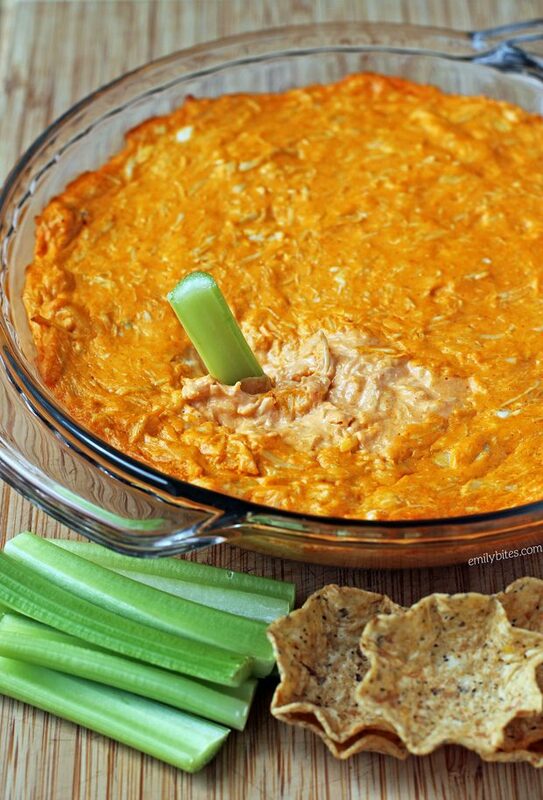 I’m so excited to see buffalo chicken dip on here! I have my own recipe which is probably super unhealthy so I can’t wait to try the lightened up version! What brand of lite blue cheese dressing do you use? fat free ranch is less points than light dressing. Do you know what the smart points value would be if I substituted? I’m sorry, I don’t! You’d have to run it through the recipe builder with whatever brand of ranch you’re using. I made this a few weeks ago and it was awesome! I made a few substitutions. Great Value (Walmart’s brand) has fat free cream cheese, Wish Bone has fat free blue cheese dressing, and Kraft has fat free shredded cheddar cheese making it 1 SmartPoint per serving!! Did using Fat Free items effect the taste?? This recipe says “yield 12” does that mean there are 12- 1/4 cups? That seems impossible. That means 3 cups and I just made this recipe but it doesn’t look to be 3 cups. It is delicious btw! Ty for sharing!